I was super excited. As in my eyes bulged when I saw them and I was smiling to myself like a crazy person. If you have eyes like mine (which a lot of Asians do) you’d find that even waterproof, smudge-proof products – especially when you use black – don’t always stay put and often transfers down to the under-eye area. Now there are some products that absolutely don’t move at all (i.e. MAC Liquidlast Liner) but they don’t always give you the look you want to achieve. Anyways, when I know I’ll be wearing makeup from day to night, I always carry a travel pack of q-tips and a bottle of eye-makeup remover with me, which adds weight and is bulky when you’re carrying, say, a fancy clutch. Another option is travel size makeup wipes but they’re expensive and wasteful for small touch-ups. So the makeup remover liquid stays in place until you the snap the end with the purple strip. Then the makeup remover moistens the other end and you’re ready to use it! Now the question is, how effective is the remover? 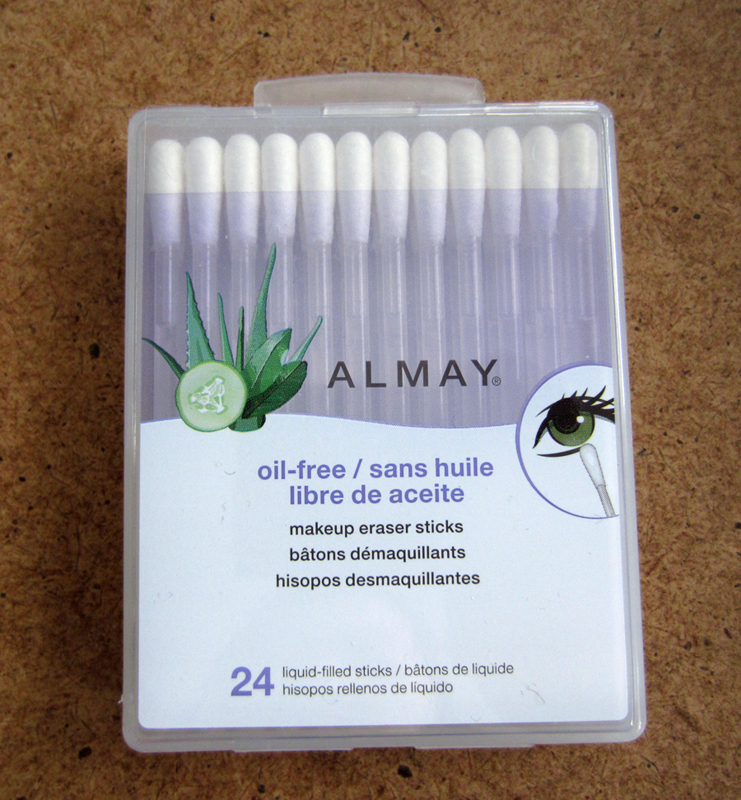 Most drugstore ones I’ve used have been pretty useless and requires a lot of scrubbing which irritates my eyes. 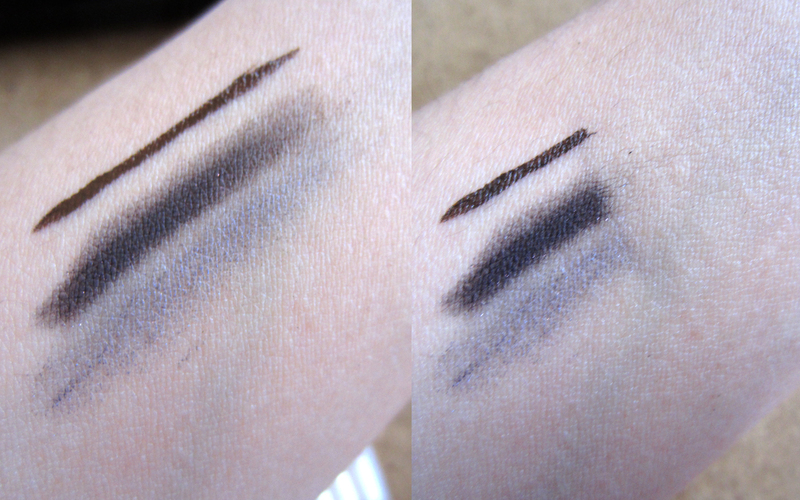 So here’s a swatch test using a liquid liner and dark shadows. Lightweight and small – perfect for those on-the-go! Effective formula to remove darker makeup. Oil-free so it doesn’t make the other parts of your makeup run if you just want to touch-up. 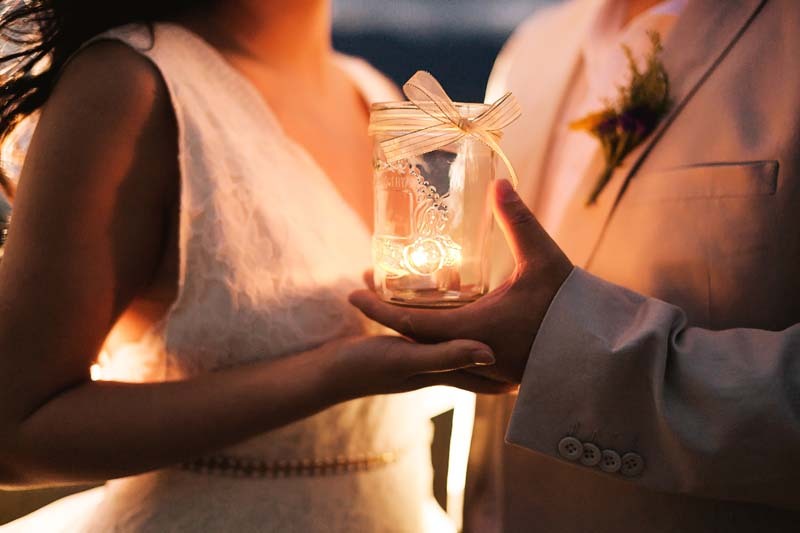 Perfect for brides as part of their emergency kit. Cheap or expensive? It’s $5.99 so I’ll let you decide. Decent for me. No cons as far as I know but maybe I’ll figure it out after using it. 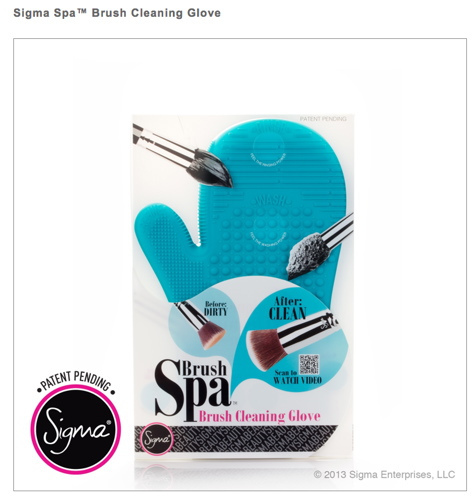 Alright so who has seen this brush cleaning mitt? It seems to be al l the rage lately on youtube from all these makeup gurus. “DANG it’s expensive for an oven mitt!” – It’s $39 usd. Even after that, I was tempted enough to attempt to order it for one reason alone and also the same reason I wanted to invent one in the first place – to prevent my hands from drying out like crazy. I wash my brushes after each client and I have a lot of brushes. Swishing each in my hand with soap and hot water does no favours to my already-dry skin. So I proceeded to checkout and WHAT THE HECK $11 for shipping?! Okay, I’m too frugal (i.e. cheap) to pay $51 for an oven mitt. It was $2 and I thought the texture and material is probably the same as the oven mitt so SURE let’s give it a go and see what happens. I wet my brushes lightly with water. Dip it into a soap solution and scrub a couple of times on the pad (in the second photo, I literally just swished 2-3 times over the surface). Rinse with warm water while scrubbing along the pad to remove excess soap. Not only did I clean my brushes in half the time thanks to the small bumpy texture, it actually removed bright red lipstick stained onto my lip brush that I normally could not get off without alternating 99% alcohol and an oil-based makeup remover. Sure my hand still got a bit wet but nothing to compared to what it was like before. I’m sold! The only thing I would change is to make the surface area as big as my palm for my bigger fluffy brushes. I made an attempt at Daiso again to see if they carry a silicone scrubbing pad for the body (^_~) but alas they did not. Maybe one day! 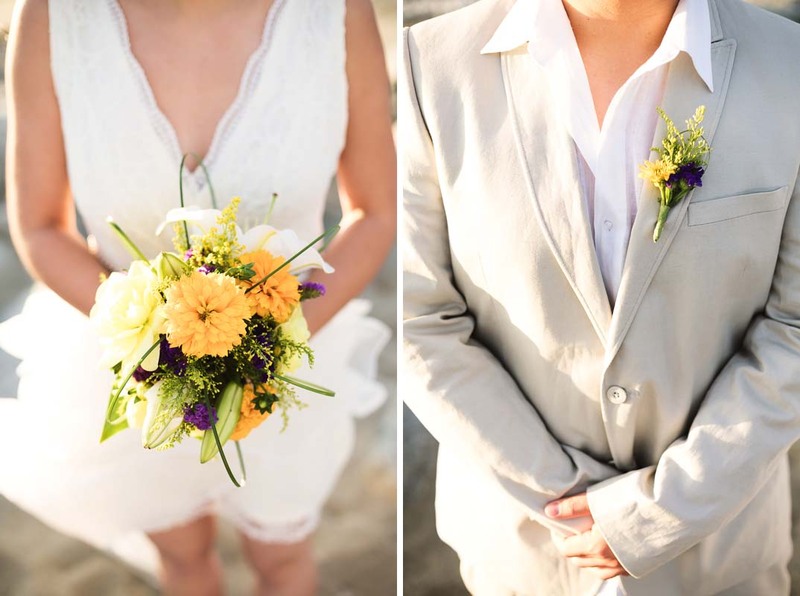 I love the whimsical look of the pins and the fancy name (Dewed Vines Hairpin) also helps set the mood. However, with all the expenses of wedding planning, I could never justify spending $140 on two hair pins. So I did some research here and there. There are hairpins that are similar on Etsy and other websites but they are all fairly pricey. One day in the summer, by total fluke, I was driving by Beazu – a wholesale bead store – about a week after it opened and I whipped around the block so I can go in and take a better look. I was in DIY HEAVEN! Spent hours in there trying to plan out what I wanted to make. 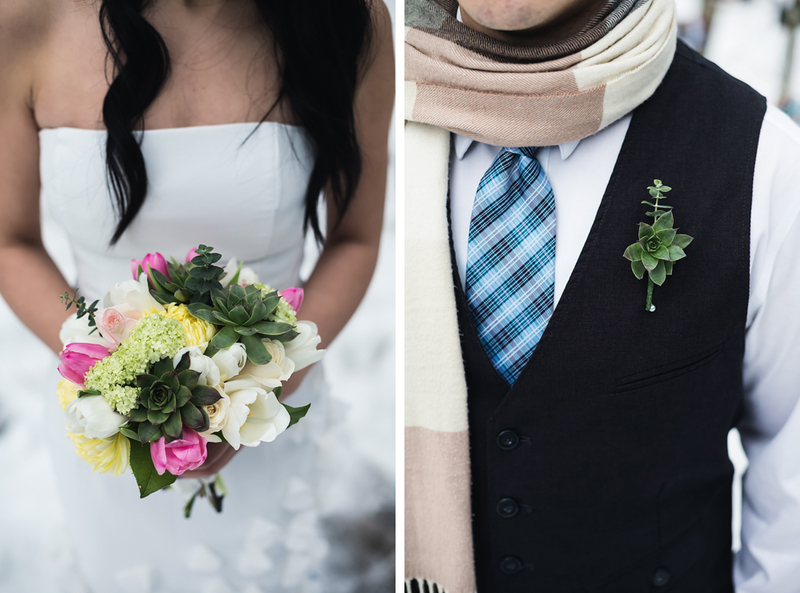 I found some great items to recreate these beautiful pins. A box of tiny spools of gold wire (I think it was about $12-15), a bag of clear 4mm bicone Swarovski crystal beads ($11.62), and a bag of crystal golden shadow 3mm bicone Swarovski crystal beads ($14.81). Depending on how long you want each vine of crystal to be, you can play around with it. Slide the first bead into the center of the wire and start twisting for about 1 cm. Take slide another bead into one piece of the wire and twist again. Do the same with the other wire and keep alternating – just approximately it and do it randomly to keep the look natural. I made 10 vines, using the two different coloured crystals but you can use pearls or different sizes and shapes of crystals to change up the look. I grabbed a hairpin (one similar to your own hair colour) and twisted the ends of each vine individually around the hairpin. Make the stamen of the ‘flower’ shown above and twist between the vines. Push all the vines together and wrap a separate wire all around the hairpin to secure all the vines in place. Re-shape the vines into anything you find attractive! I like the pinwheel shape. And here we go! For about $44 (with a lot of extra materials left to make more!) 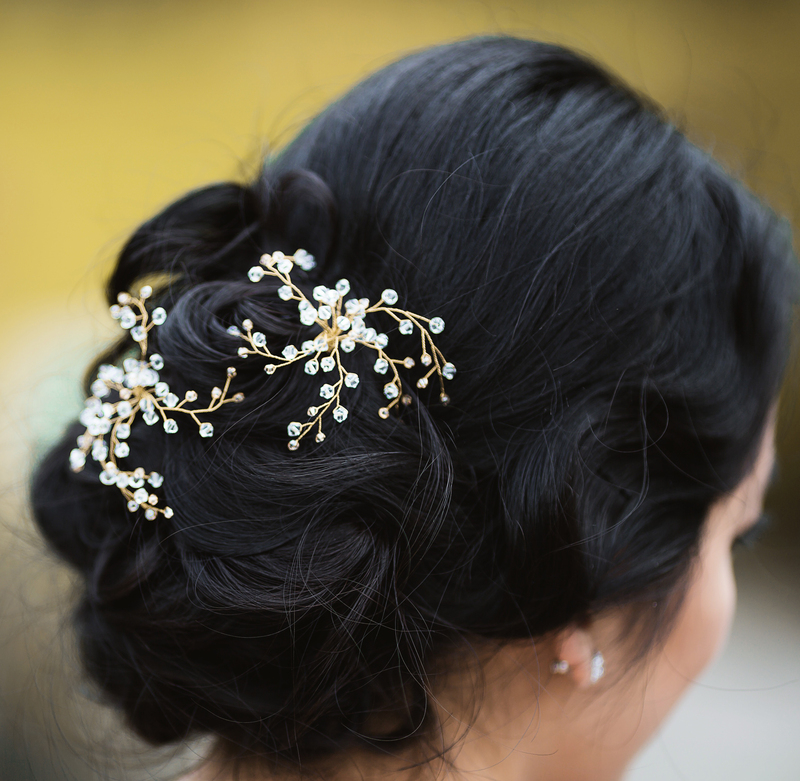 you can get your own customized crystal hairpins for your big day. They’re so classic and pretty that they can also be worn for any special occasion, like prom or Christmas parties or weddings (as a guest) or maybe even a casual summer dress for a nice night out. Above is a shot of me wearing it during my autumn photoshoot (this was taken at the end so the hair is a bit ruffled – excuse that 🙂 ). 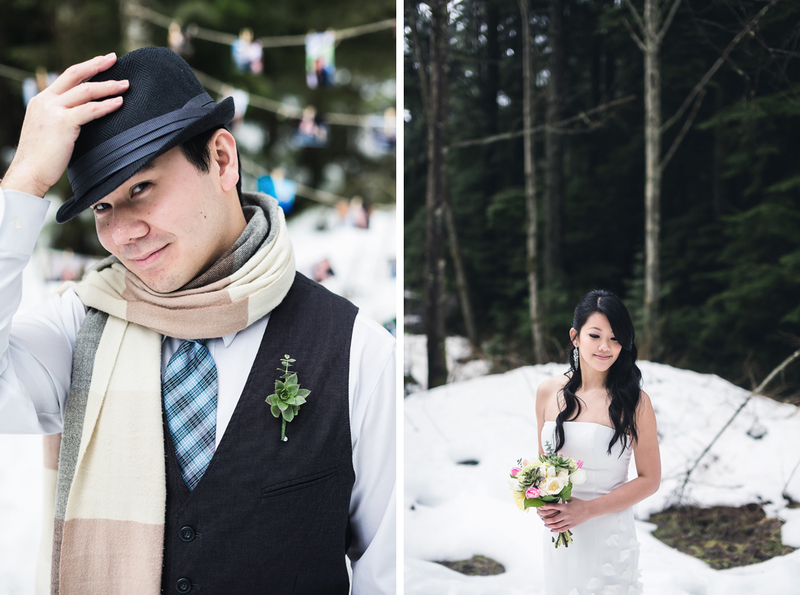 Since I didn’t have a dress made for this season (I wore my sister’s wedding dress instead, which is another way to get some variety in your pre-wedding photos) the hairpins tutorial shall suffice! 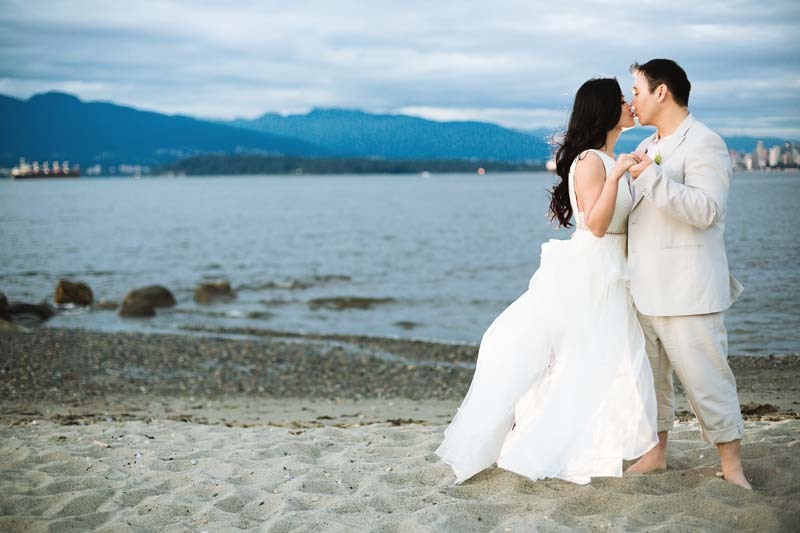 I loved the Kate dress by Ellebay Bridal with the flowiness and the lace. 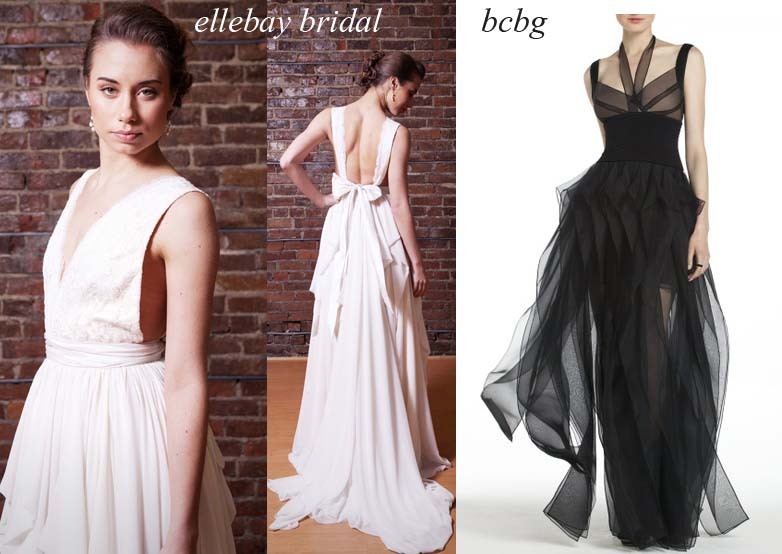 But when I saw the BCBG gown, I knew that would be perfect for a summer, beach wedding. 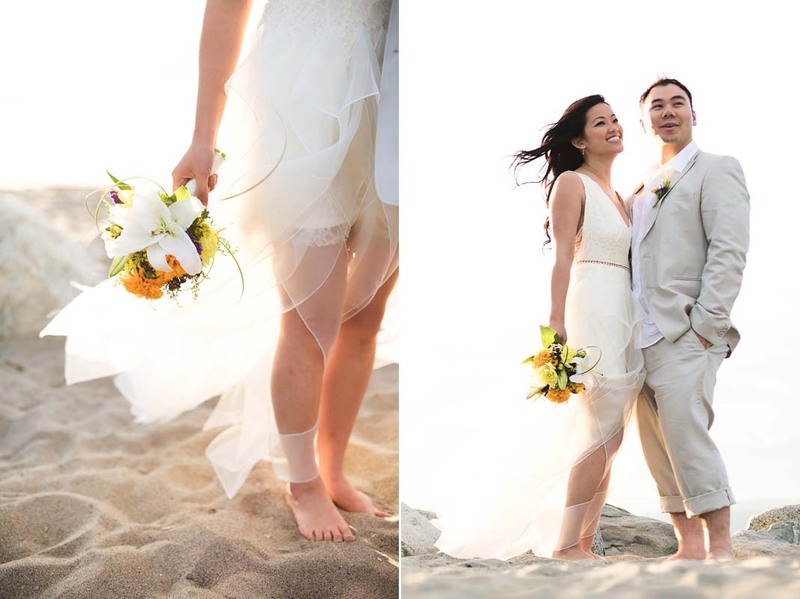 Especially with the light organza which doesn’t restrict movement and would not weigh me down if I wanted to walk into the water. Fabricana is like my candy store. I can spend hours in there – three to be exact. You have no idea how hard it is to find beautiful lace. The pattern I picked was a very common one that comes in many colours for a reasonable price. Organza was on sale so bonus for me! After picking up lining and notions, I was ready to start! 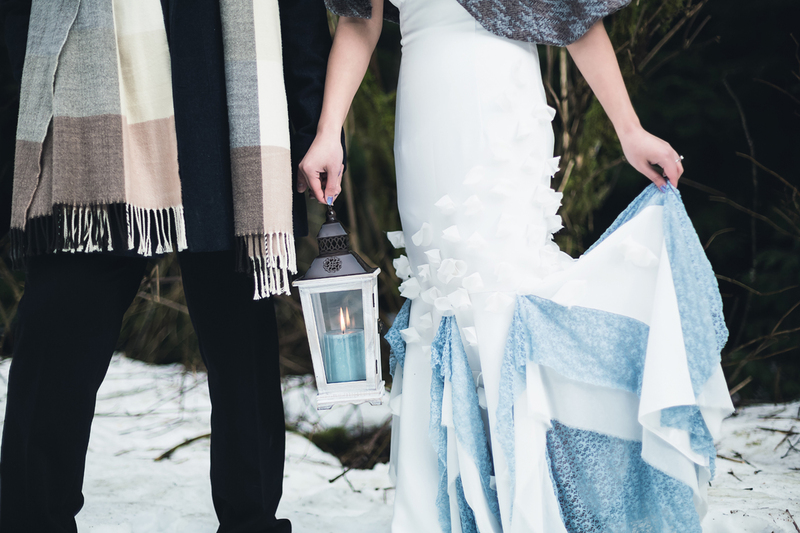 There are many sources on YouTube, even for the untrained DIY bride, to figure out how to create a pattern from a dressform. 1) Place muslin fabric (or any non-stretch scrap material) and pin onto the lines you marked. Cut off whatever you don’t need! Do this for half of the dressform. You simply need to double it when you cut the fabric to create the other side and it will be symmetrical. 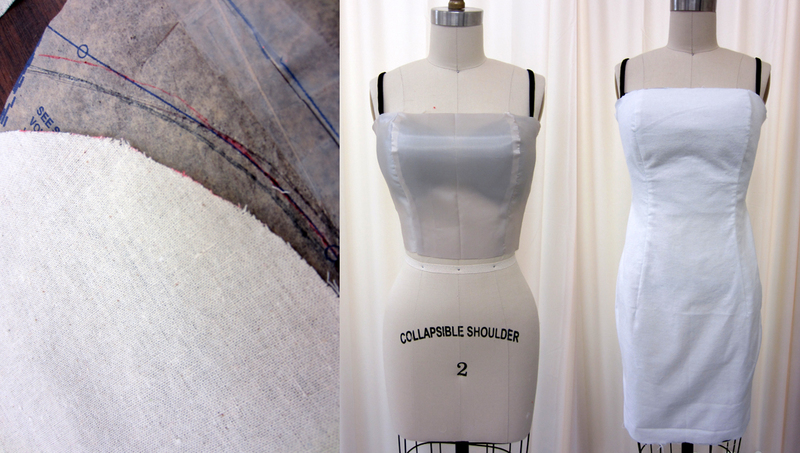 2) Remove the muslin pieces from the dressform and trace on paper, adding 1.5cm seam allowance around the edges. Mark the corners, notches, darts, etc. Place onto fabric and lining and cut. 3) Sew the bodice and skirt pieces separately. 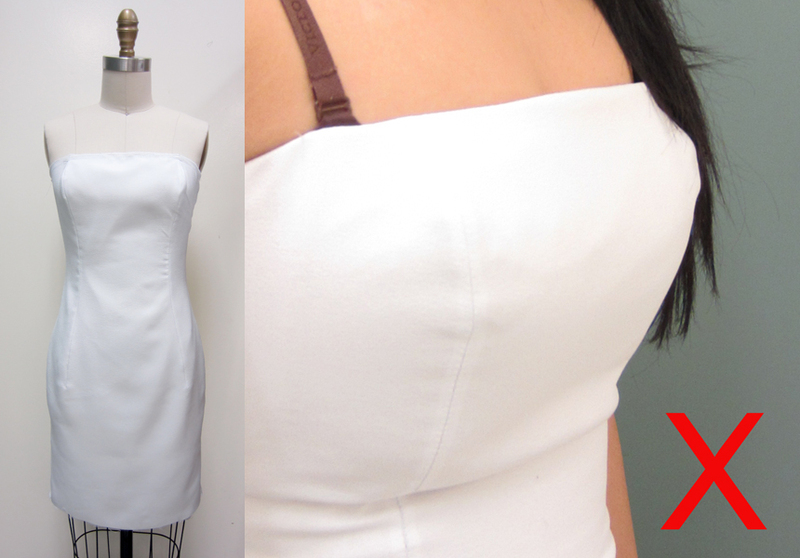 Attach the bodice to the lining and make sure it fits! 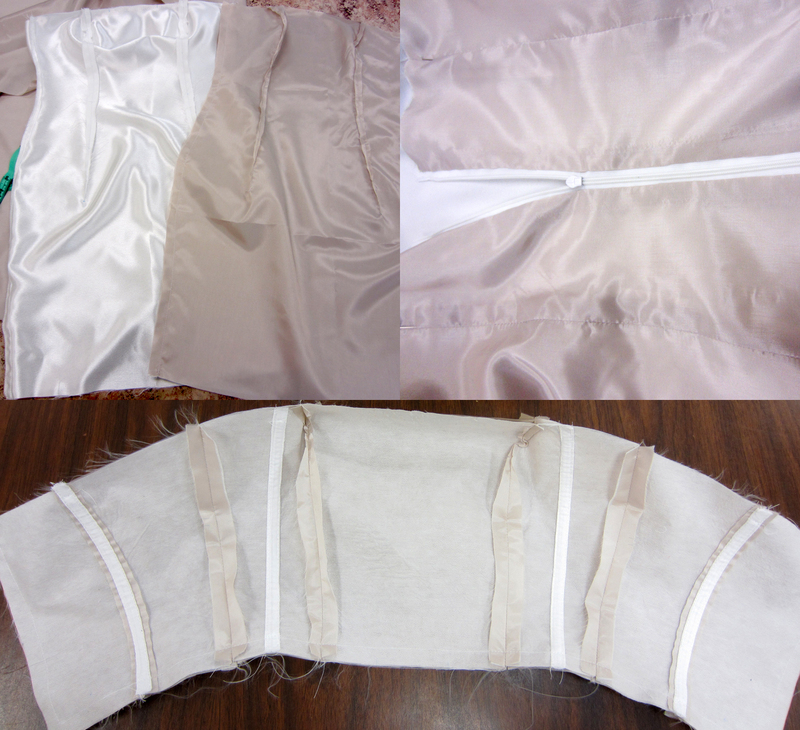 Add bias tape to the waist of the lining to prevent stretching. 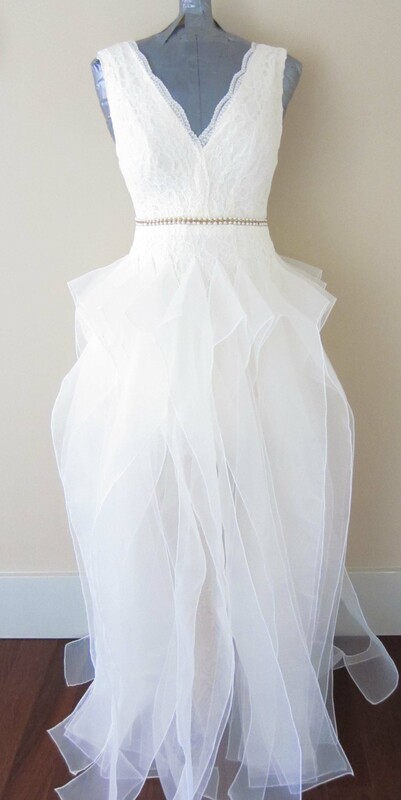 4) Pin the bodice onto the dressform and drape the lace over it. Pin in place, creating the form of the body. Using similar coloured thread that blends into the lace, handstitch it onto the bodice and onto the skirt. 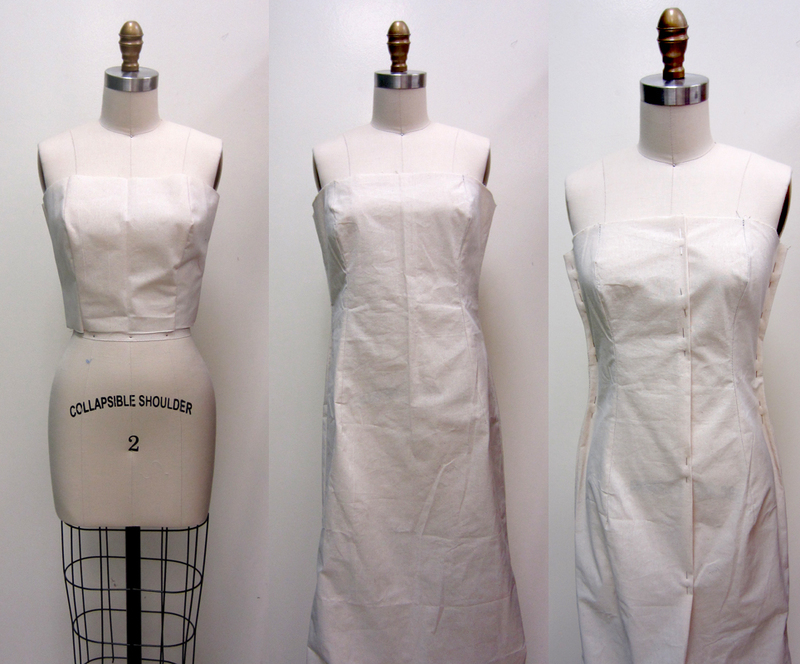 With right sides together and the bodice in between them, stitch together the skirt to the lining. Add invisible zipper to the back. 5) Tear the strips of organza by hand. Since it’s woven, non-stretch material, it rips very well and ends up perfectly straight. Create a rolled hem all around the edges of the strips using a serger. 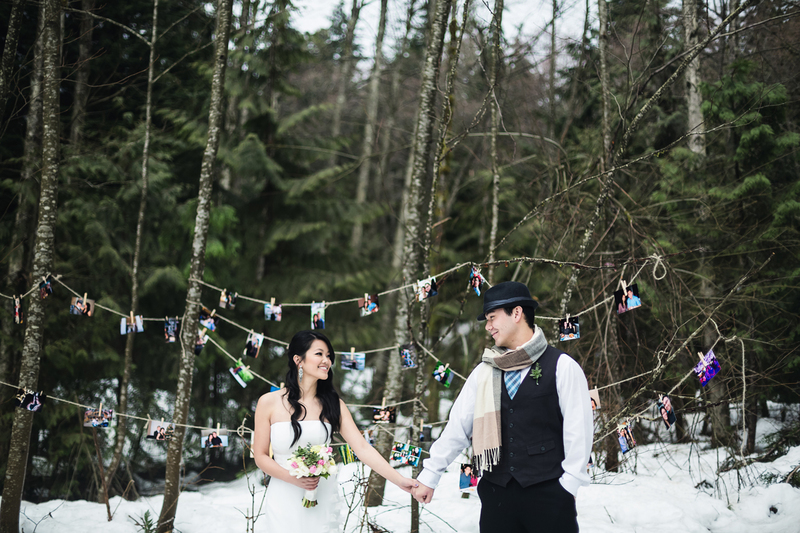 Fold the strips in half and press with an iron – props to Ursula for doing all of this part! 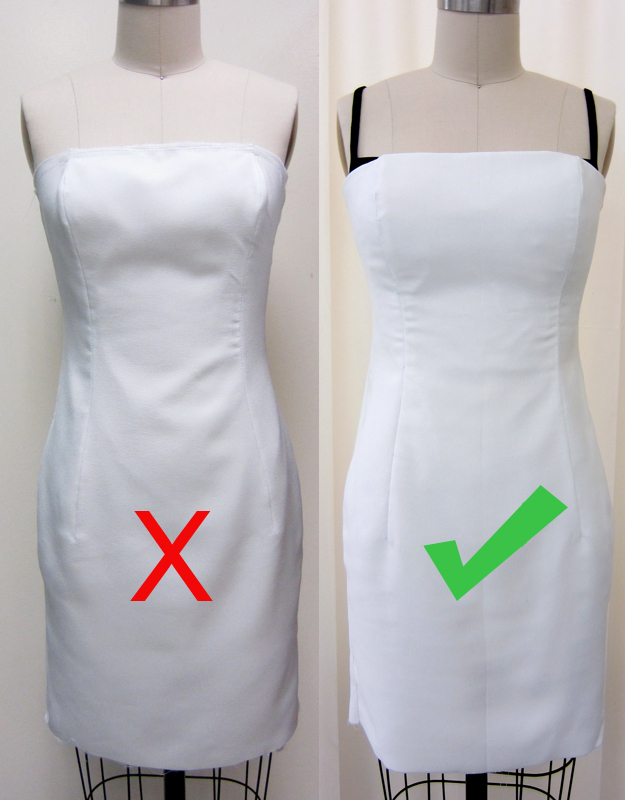 Pin onto the hip of the dress to determine the distance between each strip. Take it off the dress and connect them all together by stitching 5cm between them (imagine being little people holding hands). Pin the strips back onto the dress and space them out evenly. Handstitch each piece into place. The sides were too bare and every time I bent my body, I would flash someone so I took some spare lace lying around and handstitched in onto the sides to close it off and add a bit of embellishment. Ursula noted that there was something missing and said I should add a sash because the waistline looked bare and incomplete. 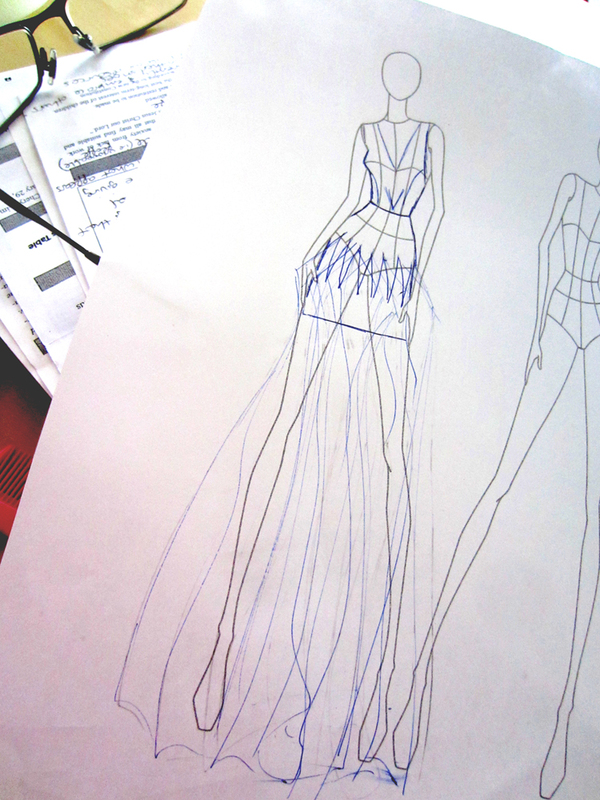 I felt a sash would add too many varying materials into the dress and cheapen the look. So I dug around and found this $5 faux pearl necklace I thrifted when I was visiting Oregon coast. Lo and behold, not only is it the perfect addition the dress, the length fits around perfectly!!! And *drum roll* the final product! Total cost was about $55. Not too shabby! I was extremely happy with the product and I finished it not a moment too soon – on the day of the photo shoot. 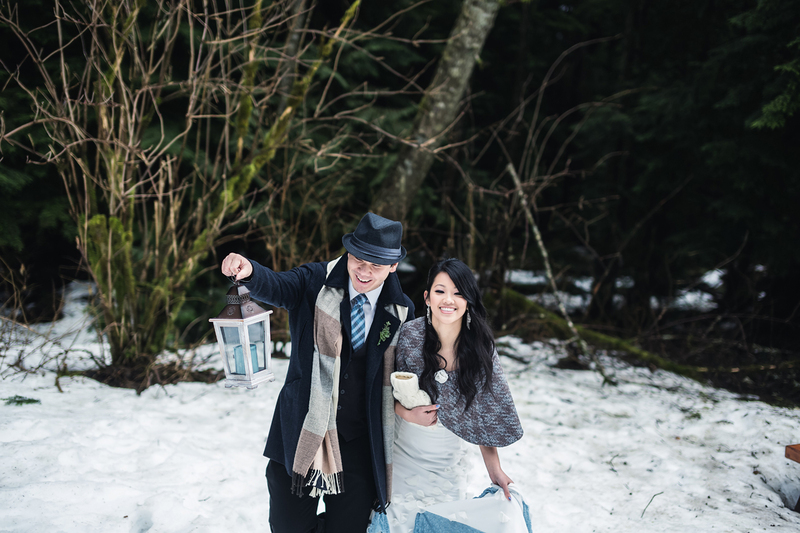 Special thanks to – Sam Chin for the suit; Ursula Tsang for assisting me in this project; Brenda Tsang-Chu for baking delicious treats used as props in the shoot; Jason Fung for being an awesome fiance and prepped the other props for the shoot. Enjoy some pictures of it flowing in the wind!